Computer historian John Pratt, curator of the "machines that Count" exhibition on now at Auckland's Museum of Transport and Technology, provides weekly insights into the history of computing. The take-home ‘electronic brain’ In the history of information technology there is nothing that stands out quite like the personal computer. The idea of bringing a computer home certainly captured the imagination of anyone who worked with or even knew what a mainframe was back in the 1970s. A generation which had been raised on the notion of “electronic brains” that cost millions, and used as much power as a small city, leapt on the microprocessor as soon as it became available. And machines like the MITS and IMSAI followed. They were programmable, in binary, but that meant little to most people. It would be another 18 months before there was a small, genuinely “personal” computer available that could take instructions from a keyboard. In April 1977, Apple launched the Apple II, at the East Coast Computer Faire. Here, for the first time, was a computer that you could use right out of the box — just hook it up to television and get going! Designed by Steve Wozniak, the Apple II took its cue from the mini-computers that were becoming so popular with medium-sized businesses and computing bureaus. Wozniak himself cited the Data General Nova’s “elegant” architecture. The Nova is the machine that Wozniak had told everyone he would own one day. No surprise then that, like the Nova, the Apple II had a common data bus with eight expansion slots. The expandable architecture is what made the Apple II. The base Apple II shipped with just 4Kb of RAM, but installing more on an expansion card was child’s play. The 6502 processor could only address a maximum of 64 Kb of RAM, however, and a lot of clever hacks were devised to address additional memory. Other expansion cards were offered, including a high-resolution (80-column VGA) monitor interface, a card developed by Microsoft to enable the Apple II to run CP/M and Microsoft’s version of BASIC. There were also game-controller cards and even a network card that connected Apple IIs to a central file server. IBM could hardly have failed to notice the market that opened up for the new generation of computers in the late 1970s. First Apple and then Commodore set new records for stock sales on the share market, and both were selling billions of dollars worth of the new generation of computers. IBM had nothing like the Commodore 64 or the Apple II in its line-up, but these machines weren’t bought by typical IBM customers. To take on the likes of Apple, Commodore and Radio Shack, Big Blue would need not just a new machine, but a new path to market. On US Independence Day in July 1980 “Project Chess” was given the green light. IBM executive Don Estridge was given the job of getting IBM a seat at the board. To do this, Estridge and his hand-picked team of 12 needed to have a prototype ready for evaluation in just 30 days. IBM had a proud tradition of making almost everything it sold, but there was no way it could, using just its internal processes and procedures, design and create a prototype an entirely new computer in one month. To be free of the bureaucracy of IBM’s research centres at Poughkeepsie and Endicott, the “Dirty Dozen” of Project Chess were based in IBM’s small-systems division, in Boca Raton, Florida. At the same time, Intel had conceded internally that Motorola’s 68000 was a better processor than either their 8088 or 8086 chip, but an ambitious Intel salesman, named Earl Whetstone, cold-called IBM — and struck gold. The only overlap between Project Chess and IBM corporate came in the selection of the Intel processor. The “Dirty Dozen” engineers considered using the 16-bit 8086 chip, but eventually settled on the 8088, because the 8086 chip had the potential to threaten the performance of the bottom-end of IBM’s mainframe systems. Armed with an Intel development kit, the team had time to do little more than assemble their new machine, from freely available parts. Code-named “Acorn”, the standard “Acorn” contained three printed circuit cards — the mother board, floppy-disk controller and display adapter. Like the leading mini-computers, the new PC supported an expansion bus, making it readily expandable. IBM made the keyboard, which inherited its 83-key design from the Selectric “golf ball” typewriter. The keyboard aside, there was just one moulded part in the PC. This was its simple front panel. The rest of the machine was spot-welded together, out of folded steel, requiring almost no lead-time to manufacture. The power supply came from Zenith, the floppy-disk drive from Schugart or Tandon and, of course, the 8088 CPU chip from Intel. Really, the only proprietary technology in the whole machine was the code on the BIOS ROM chips that gave the machine its most basic instructions. In August, the prototype was given the nod and the team was granted another 60 days to get the machine ready for market. In reality, it would take another year to get the PC onto shelves, however. New US Federal Communication Commission regulations had already seen Radio Shack withdraw Tandy’s TRS-80 desktop micro-computer because of RF interference. IBM’s new machine couldn’t meet RF standards either and needed more than 100 revisions to make it RF-friendly. The following year, in July 1981, IBM started to ship advance copies of its PC, under a shroud of secrecy, to Sears Roebuck and to Computerland stores. Then, just days before its launch, a potential short was discovered in the power supply, and all the machines that had already been shipped had to be returned and substituted. 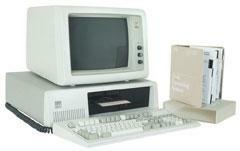 Finally, on August 12, 1981, IBM launched its first personal computer. The novel thing about the IBM PC was the IBM badge itself. IBM was a US$29 billion giant. In developing a PC, it legitimised the concept for everyone.